Of course, this number is an average, so there are women who shop far less frequently and women (including one named Kristen P….) who shop more frequently. And of course, this survey includes ALL types of shopping, not just shopping for apparel. However, the survey did find that apparel was the most popular shopping category among women, followed by food, shoes, and presents. Don’t start judging us girls just yet, though. According to one OnePoll.com spokesperson, many women are shopping not for themselves, but for friends or family members. They’re buying clothes, shoes, and groceries for their children, spouses, nieces/nephews, etc. The results of this survey definitely got me thinking about my own shopping habits. I’m definitely one of those women who love to shop and would do it all the time if she didn’t have other stupid crap to do. But when I think of “shopping”, I always think of clothes or shoes. Is that REALLY what I spend most of my time buying? In my case, I think the winner might be food/groceries. 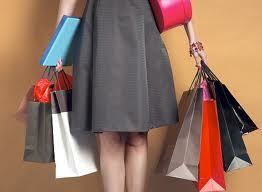 How often do you ladies shop? Did the “400 hours a year statistic blow your mind, or were you like, “yeah, makes sense”? Do you shop for clothes most often, or for other items, like books or groceries? Gents, how ‘bout you? Let us know in the comments.